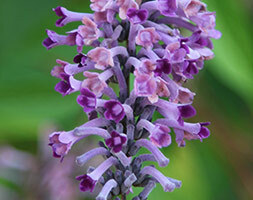 At the ends of the slender, arching stems, curved, dark violet flowers form nodding, tapering panicles that emit a delicate scent and act as a magnet to butterflies. This vase-shaped, deciduous shrub also boasts handsome, dark green leaves throughout the warmer months, so it works well towards the back of a mixed shrub border. Alternatively train it against a sunny, south-facing wall where it will appreciate the added protection in winter.